Dedicated to St Michael, also known as the Archangel Michael, who from the 4C has been regarded as the healing angel and protector of the Church. St. Michael is also considered the patron saint of police officers, paramedics, firefighters and the military as well as the sick and suffering. The earliest extant reference to a church being built on this site is in 1647, as recorded on the lintel over the former chancel door. The location was possibly the site of an ancient Neolithic burial mound. The first church building was likely to have been constructed partly of timber and plaster as a chapel of ease under its mother parish of Prestbury. Unfortunately many of the earliest records detailing the history of the church and parish have been destroyed. 1790 Following a report in 1786 of the building being in such disrepair it was considered unsafe, a temporary renovation was undertaken. This was followed by reconstruction of the roof in 1816 following partial collapse. 1820 Tower constructed onto nave and housing single bell chamber. 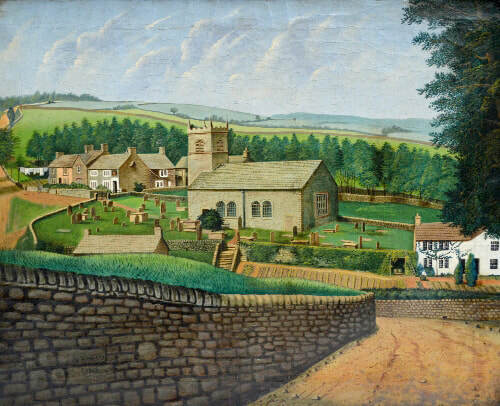 1869 Wincle became an ecclesiastical parish separate from but under the patronage of Prestbury. 1882 Restored church opened. Designed by E Witts, the plans, which utilised the existing east and west walls, were to accommodate only 120 (reflecting the reduction in parish population). 1900 Dedication of new organ in memory of Marianne Brocklehurst. 2015 The parish became part of the united benefice of Bosley, Sutton, Wincle and Wildboarclough, North Rode having joined Gawsworth. 2018 Reordering of the interior to allow for the installation of the new digital organ, toilet facility and improve access.